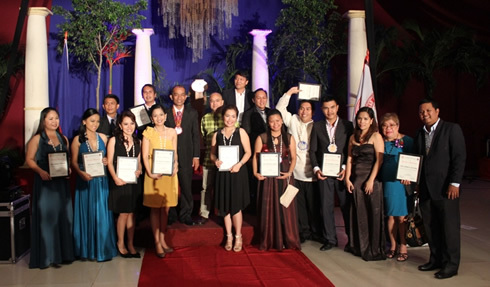 Western Mindanao State University-College of Law held its annual Testimonial Dinner in a grand but conservative manner. The formal dinner took place at the Astoria Regency of this city. Dubbed as Testimonial Dinner, it is a night of toast and congratulations to the barristers who made it to the 2011 Bar Examinations. The 19 newly-minted lawyers were given the privilege to deliver speeches, sharing to the lawyer hopefuls about their journey in making it to the Bar. The new lawyers, being themselves as an example of success and determination, very much inspired the law students and as well as the faculty. The bar passers were also accorded certificate of commendation by the College of Law. The night of celebration also recognized the law school’s uninterrupted commitment to the legal education and to the legal profession as well. It has been 30 years of relentless pursuit in crafting men and women of the law in this part of the country. This is more exemplified through the event’s theme– The WMSU College of Law: 30 Years of Legal Education as Foundation for Justice, Human Rights and Peace. The law school is proud and honored to have Atty. Jose Manuel S. Mamauag, Commissioner of the Commission on Human Rights as the guest of honor for the occasion. Atty. Mamauag is a known advocate of Human Rights in the country, he is a lecturer on Human Rights Law & Law of War or Law of Armed Conflict & Criminal Law before the AFP and PNP Training Schools; a lecturer on human rights and Philippine laws in various government agencies, academic institutions, tribal groups, military and business sectors; instructor of Political Science and Business Administration, MSU-IIT. He was also a TV Talk Show host of “Let’s Talk”, IBC of this city. Also a significant part of the event, the Induction of Class and Law Students Association (LSA) officers and as well as the Turn-Over Ceremony were also held. Dean Sanson initiated the oath of office of the different elected officers. The law students were all the more motivated as the affair was attended by their law professors. Some of the distinguished faculty members who graced the occasion were Retired Judge Ernesto Gutierrez, Atty. Floriza Sales, Atty. Grace Tillah-Alasco, Atty. Florencio Liong, Jr., Atty. Czar Ciro Sedillo, Atty. Quirino G. Esquerra Jr., Atty. Ray Bongabong, Atty. Honoriza Krystle Monjardin-Lavista, Atty. Jihan El. Edding, Atty. John Paul Pagteilan, Atty. Roberto Rivero III, Atty. Anthony Quin Balagot, and Atty. Meltino Sibulan.